As commander of Syrian intelligence in Lebanon, General Ghazi Kanaan is by all accounts the paramount power broker in the country. All high-ranking Lebanese officials report directly to Kanaan and he has the final word on all major political and security decisions made by the Lebanese government. Kanaan, aged 57, was born to a prominent Alawite family in the village of Bhamra near Kerdaha (Syrian President Hafez Assad's hometown) in the mountains overlooking the seaport city of Latakia. Contrary to many reports, Kanaan is not related to Assad, but their two families have had a long historical alliance. Like Assad and other senior Syrian officials, he joined the military early in his career, reportedly commanding an army unit facing Israeli forces in the Golan Heights during the 1970s. Kanaan rapidly advanced through the army officer corps. He attained the rank of Colonel and served as head of Syrian intelligence in Homs until 1982, when he was appointed to replace Gen. Mohammad Ghanem as the commander of the mukhabarat (Syrian Intelligence Service) in Lebanon. During the Lebanese civil war, intelligence forces under Kanaan's command established their headquarters in Anjar, an Armenian village in the Bekaa Valley (ironically, the place where Lebanese prince Fakhr al-Din defeated the Ottoman ruler of Damascus in the 18th century and imprisoned him in a cage). Additional bases and detention facilities have been established in West Beirut (on Sadat Street and in the Ramlet al-Baida neighborhood near the Beau Rivage Hotel), Tripoli, Chtoura and Hazmiyeh. Kanaan is credited with gradually tightening Syria's grip over the Lebanese government during the 1980s by cultivating alliances with members of Lebanon's militia elite. In 1983, Kanaan ordered his militia allies to torpedo the May 17th Agreement between Lebanon and Israel that was brokered by former U.S. Secretary of State George Shultz. In 1984, Kanaan masterminded the February 6 mutiny in West Beirut that led to the breakdown of the Lebanese central government and the withdrawal of multinational peacekeeping forces, including U.S. Marines, from Lebanon. By the late 1980's, Syrian influence pervaded throughout the country as militia leaders of all sectarian persuasions came under Kanaan's influence. Those who resisted Syrian influence were either assassinated (e.g. Hasan Khalid, the Mufti of Lebanon's Sunni Muslim community, in 1989) or abducted and imprisoned by Kanaan's forces (e.g. leaders of the Sunni Tawhid al-Islami movement and the pro-Iraqi wing of the Ba'ath Party in the mid-1980's). 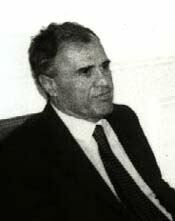 Kanaan's most significant achievement during the 1980's was his successful effort to lure collaborators within the predominantly Christian (and ostensibly anti-Syrian) Lebanese Forces (LF) militia. This process began in 1985 with the defection to Syria of LF Commander Elie Hobeika (notorious for the 1982 massacre of Palestinians in Sabra and Shatila) and culminated with the decision of LF Commander Samir Geagea to collaborate with Damascus in October 1990, when Syrian forces invaded East Beirut and ousted the constitutional government of Lebanon headed by interim Prime Minister Michel Aoun. Less than a month later, the parliamentarians obediently convened and extended Hrawi's term in office. More recently, Kanaan personally oversaw the formulation of a new law late last year which strongly preordains the election of pro-Syrian candidates in Lebanon's upcoming parliamentary elections in August. Kanaan, known to his associates as Abu Yo'roub (after the name of his eldest son), has used his influence for personal gain as well. His involvement in narcotics production and trafficking in the Bekaa Valley, counterfeiting and other illegal activities have made him a very wealthy man. With the shadow of Syrian power lurking behind him, few in Lebanon are willing to stand their ground in disputes with Kanaan. One who did is Yahya Shamas, a former member of parliament and long-time associate of Kanaan's who made the mistake of buying a piece of real estate from the Syrian general and then refusing to sell it back when its value started rapidly appreciating. Shamas was quickly jailed on drug trafficking charges in 1994 and imprisoned. Kanaan is even rumored to have had affairs with the wives of numerous Syrian-backed Lebanese politicians who know better than to object to such impropriety. Kanaan's success in subduing Lebanon has earned him tremendous accolades in Damascus. Until recently, there was much talk of Kanaan replacing Ali Douba as the head of Syria's entire intelligence apparatus (it is now said that Douba will be replaced by the deputy chief of military intelligence, Gen. Hassan Khalil). Kanaan's early support of Bashar Assad, the son and apparent successor of President Assad, has considerably strengthened his influence within the regime. He also has good relations with several American officials, particularly in the intelligence community, and has visited Washington DC on at least one occasion (in February 1992).3 As a result, his political future in Damascus is considered to be very bright. 1 Al-Hayat, 2 October 1995. See also "Syria wants Lebanese legislators to extend Hrawi's term for three years by a show of hands," Mideast Mirror, 2 October 1995. 2 Human Rights Watch, An Alliance Beyond the Law: Enforced Disappearances in Lebanon, May 1997. 3 Kanaan's two younger sons attended George Washington University in Washington DC, reportedly with their expenses fully paid by former Prime Minister Rafiq Hariri.